Biography Anna BARTKIEWICZ, Ph.D., D.Sc. 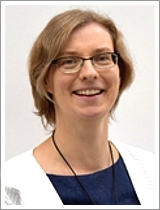 Anna Bartkiewicz has been an adjunct at the Department of Radio Astronomy of the Centre for Astronomy at the Nicolaus Copernicus University in Torun since 2007. In the PhD thesis she analysed methanol maser emission at the 6.7 GHz in high-mass star forming regions using the European VLBI Netwok and discovered the ring-like structures. Using the UK MERLIN interferometer she made OH maser emission images at the 4.7 GHz and 1.6 GHz of Cepheus A and determined the magnetic field 3d structure. Anna Bartkiewicz continues her methanol maser research using the world radio astronomical instruments. She belongs to the Bar and Spiral Structure Legacy survey (BeSSeL) team http://bessel.vlbi-astrometry.org that estimates the distances via the trigonometric parallaxes deriving the structure of the Milky Way.